Profile: There's a fine line between Genius and Insanity; I happily straddle that line. I've been into Anime for about as long as I can remember, but my favorite show is still ROBOTECH, the Macross Saga. 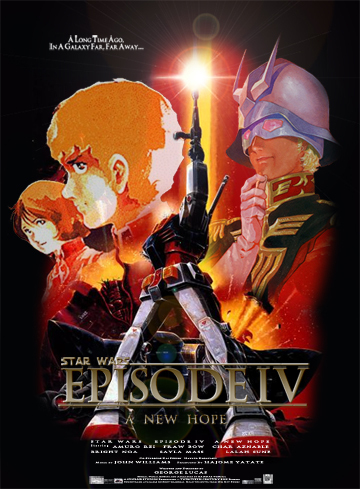 I say this because I've seen the original, Japanese version, and I have to say that I really do feel that the American version is a lot better. The music is much, MUCH better and more thematically appropriate for the piece, and the storyline has a much more developed structure and backstory; so sue me, I'm a writer - I look for these things. That aside, I do agree that the girl whom they got to play Minmei had about as good an ear for music as Ray Charles did for interior decorating. Anyway, I'm one of those rare individuals who's been with the anime craze since its beginnings, yet somehow prefers dubs over subs. Sorry, I like writing stories, I like reading them, but when I'm watching a show, I don't wanna hafta read more than what's absolutely necessary; and these days, if they don't try to make the dang show into Kiddie Hour, they really don't do all that bad a job with them, I think. I'm a film student at Rochester Institute of Technology, and I've got a few ideas for shows/movies up my sleeve; however, I'm a little paranoid about talking about my babies too much, so you'll excuse me if I don't elaborate. Anyway, I've been making videos for quite some time now, but never really had a place to get them out into the open, save Napster and Kazaa. I've actually been a member for a long time, but I kinda forgot about the whole membership thing, until one day Merm talked me into signing up, and I found out that I'd already been a member for longer than HIM! If you can't tell, my favorite character of any anime is Ryouga Hibiki from Ranma 1/2 (Also one of my favorite animes, and unrivaled favorite comic book of all time), seeing as I share three major traits with him: One, I'm very strong, despite my looks; Two, I have absolutely NO LUCK with women, save for one very cute girl, whom I thank the stars for every chance I get; and Three, I have no, repeat, NO sense of direction... I live about 40 miles north of Philadelphia, near the Delaware River; somehow, while driving my friend home, who DOESN'T live near said river, I somehow ended up in downtown Trenton, which is all the way ACROSS the river - adding insult to injury is the fact that she only lives about 10 minutes away from my house. -_______-;; For this reason, I will never drive home myself from New York. I'm not a huge fanboy, although I love Anime and everything it's capable of; I'm more into reading the Manga of the shows, because there's a depth to them that film and television just can't capture. Again, I'm one of those individuals that likes Eva, thinks it's a fairly good show and film, although not the best I've ever seen, but thinks that the Manga is a true piece of modern literature. THAT'S RIGHT, the Manga is better - Hideaki Anno is good, but Yoshiyuki Sadamoto is GODLY in storytelling, and anyone who wants to argue REALLY needs to sit down and read the comics - you'll never look at the show the same way again. True poetry in picture form. Other loves of mine are playing the violin, and of course, reading, especially Shakespeare - Hamlet's my favorite book. I haven't gotten any of my videos up yet, but hopefull that will change soon - I plan on redoing a few of them using new editing software to make them look as pleasing as I'd planned; you can only do so much with Windows Movie Maker, but, if I do say so myself, I believe I've pushed the limits as to what the program's capable of. Anyway, thanks for reading thus far, and if I've offended you in someway by insulting you're favorite anime, then my job is done. Bye!